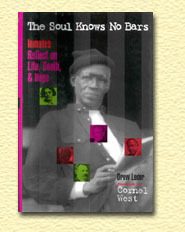 From The Soul Knows No Bars: Excerpt from a dialogue on "Violence and the Soul"
Co-authored by inmates in a maximum security prison, The Soul Knows No Bars is a unique book. It explores the dynamics of power, violence, race, and sexuality, as well as the flights of spirit possible even in a prison cell. Texts from Nietzsche, Foucault, and other contemporary philosophers stimulate "lifers" to reflect on their experiences. Drew Leder's groundbreaking work has been featured in the Washington Post, the Baltimore Sun, the Chicago Tribune, and the national media. "Drew Leder is a kind of latter-day Socrates...This is philosophy at its best-the courageous love and quest for wisdom that sheds light and enlightens souls in the heart of American darkness." Cornel West, Harvard University, from the foreword. "Put a philosopher professor into a locked room with incarcerated thieves, drug dealers, and murderers, throw in Socrates, Nietzsche, Cornel West and Heidegger - and what do you get? Conversations that knock your socks off. A book you simply can't put down." Sister Helen Prejean, CSJ, author of Dead Man Walking. "A rare gem of a book...[Leder] artfully demonstrates that inmates are not unreachable, inhuman nor incapable of being taught; nor are they uninterested in the profound philosophical tenets of thinkers like Socrates, Nietzsche, and Foucault. Leder forces us to rediscover a truth that our society often forgets. Our prisons are not filled with soulless cast-offs of little or no consequence, but with men and women who hope, feel, desire, bleed, and, most importantly, who think." Kweisi Mfume, president and CEO, National Association for the Advancement of Colored People. "Revealed in pages of this book are the intelligence, compassion, and humanity of both the prisoners and the author...Leder searches for his own soul as the prisoners search for theirs. This book belongs in every classroom and in every home-because as much as it teaches us about the human beings who are incarcerated in America's Archipelago, it teaches us about ourselves."